= MLEvalString(command) specifies the MATLAB® command for evaluation in the MATLAB workspace. Use this syntax when working in a worksheet cell. MLEvalString command works in a VBA macro. err = MLEvalString(command) returns the execution status when executing MLEvalString in a VBA macro. Enter the variable a into cell A1. Enter the numbers 1 through 5 into the range of cells from B1 through F1. Assign the range of cells to variable a in MATLAB using MLPutMatrix. Enter this text in cell A3. Use diag to create a matrix b, containing a diagonal using the five numbers in variable a. Enter this text in cell A5. 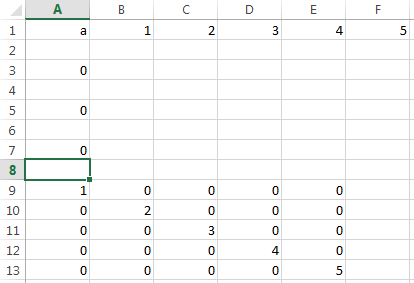 Retrieve matrix b from MATLAB into Excel®, cell A9. Enter this text in cell A7. The matrix with the diagonal appears in cells A9 through E13. Click the Developer tab in Microsoft® Excel, and then click Visual Basic. The Visual Basic® Editor window opens. Insert a new module and enter this VBA code into the Code section of the window. This sample code assumes a macro named Diagonal. For details on working with modules, see Excel Help. Run the macro by clicking Run Sub/UserForm (F5). The diagonal matrix appears in cells A3 through E7. For details on running macros, see Excel Help. Click the Developer tab in Microsoft Excel, and then click Visual Basic. The Visual Basic Editor window opens. Insert a new module and enter this invalid VBA code into the Code section of the window. This sample code assumes a macro named Diagonal. For details on working with modules, see Excel Help. Run the macro by clicking Run Sub/UserForm (F5). For details on running macros, see Excel Help. This Spreadsheet Link™ error displays: #COMMAND!. To display MATLAB errors, see MLShowMatlabErrors. Execution status, returned as a string or number. If MLEvalString fails, then err is a string containing an error code or error message. Otherwise, the command executes successfully and err is 0. By default when MLEvalString fails, err contains a standard Spreadsheet Link error, such as #COMMAND. To return MATLAB errors, execute MLShowMatlabErrors. The specified action alters only the MATLAB workspace and has no effect on the Microsoft Excel workspace.